These job skills make you most employable. Coding isn't one - is that right? Home Key articles These skills make you most employable. Coding isn’t one – can that be right? These skills make you most employable. Coding isn’t one – can that be right? 1 Which job skills are most employable? Our methodology and results. 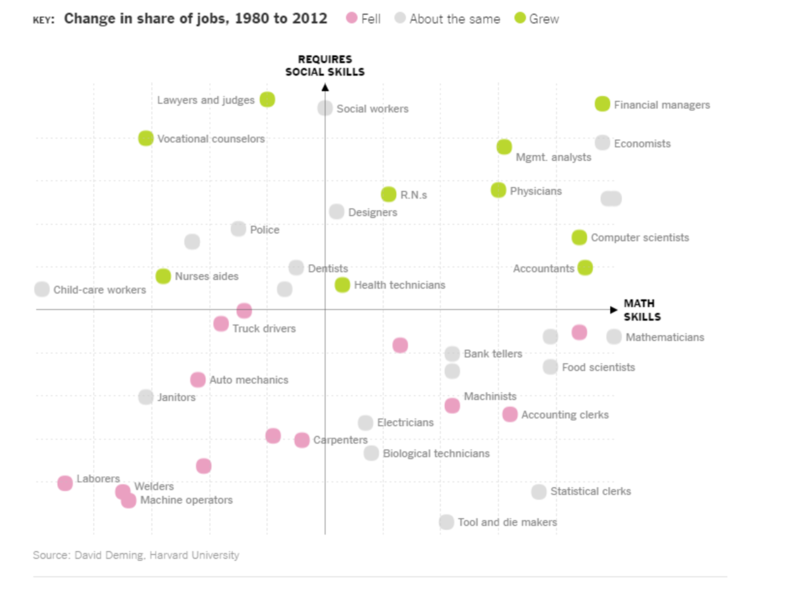 2 Why aren’t STEM skills used in the most desirable jobs? 2.4 What drove the lower scores in our analysis? 2.5 Might our analysis undervalue STEM skills? 3 Should you learn STEM skills? Perhaps. 4 What are the most valuable combinations of job skills? 5 Conclusion: which skills should you learn? Caveats: Our methodology is rough and has a number of important weaknesses, so don’t put too much weight on the findings for now. See a brief description of each skill. Read on to see how we came up with the scores and a broader analysis of the question. You can also see the technical report. Which job skills will make you most employable? Most data-driven analyses of this question that you might see in the media only look at which skills boost income or help you get a job. But this isn’t all that matters. A skill could be highly paid, but only useful in a narrow range of jobs, giving you few options if you change your mind about what to do. A skill could also be highly paid right now, but at risk of being automated in the long-term. And ultimately people care about job satisfaction, and that is not much increased by higher income. We teamed up with Tee Ponsukcharoen, a Fellow from Insight Data Science, to try to make a better analysis. As well as looking at income, we rated skills on satisfaction, risk of automation, and breadth of applicability. The results were surprising. People assume that advancing technology means that coding and other STEM skills will be most valuable in the future. But our analysis found the opposite. Rather, the skills that gain the most from changing technology are social, analytical and management skills. In the rest of the article, we explain our analysis, explore other relevant data, and come to a conclusion on which skills to learn (spoiler: don’t drop out of your coding course just yet!). Which job skills are most employable? Our methodology and results. We used data from the US Bureau of Labor Statistics, which rates 35 skills on how important they are in over 600 jobs. If a skill is listed as more important in jobs with high average satisfaction, we rated it high on satisfaction, and so on for the other traits. We added the (normalised) scores to come up with a final “value of skill” score. See the full technical write-up. 1 indicates the best score and 0 indicates the worst. The scores come from our analysis, and were renormalised to a 0-1 scale to make them easier to understand at a glance. We didn’t simply tally these numbers to come to the final value score. The details are in the technical write-up, and the raw scores are here. Time to enter depends on how much training it takes to enter the jobs in which the skill is important. Job satisfaction depends on how satisfying the jobs are in which the skill is important. Income depends on how highly paid the jobs are in which the skill is important. Risk of automation depends on the probability of automation (given by Frey and Osborne 2013) of the jobs in which the skill is important. Breadth depends on the number of jobs in which the skill is important, where each job type is weighted by the number of expected job openings in ten years. Analysis and learning, including judgement, critical thinking, complex problem solving, active learning. Management, including time management, monitoring performance, coordinating people. Social skills, including active listening, spoken communication, social perceptiveness. 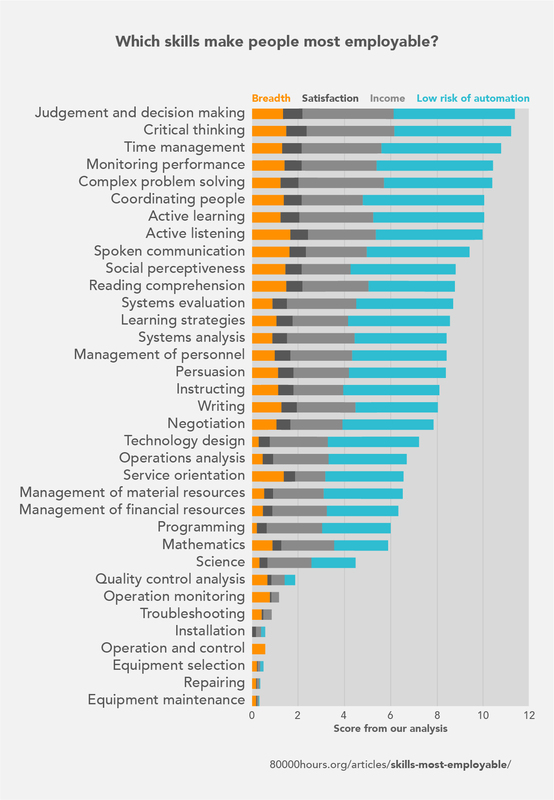 These skills are useful in a wide range of jobs, including management (e.g. CEO), finance (e.g. real estate broker, investment manager), sales, engineering, teaching, and many healthcare jobs (e.g. surgeon, optometrist). The least employable skills are those involved in manual work, such as equipment maintenance, repairing and operation and control. These skills are important in jobs such as electrician, boilermaker and manufacturing technician. The scores correlate – the skills that are useful in high-income jobs are also those that are useful in satisfying jobs with low risk of automation. The most valuable skills also take the most time to learn. This indicates that the market for skills is somewhat efficient. 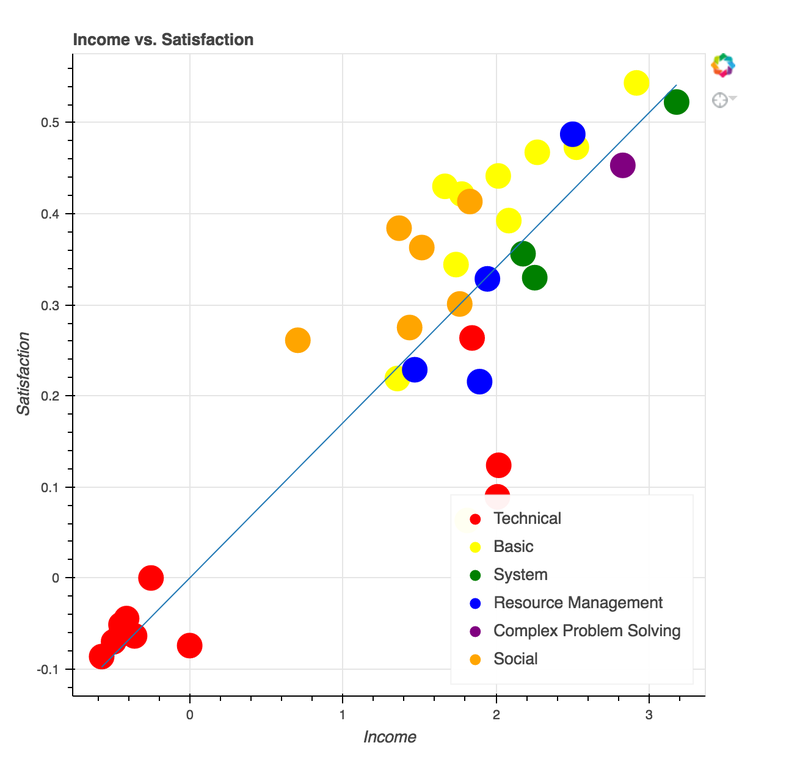 Here we can see the correlation between income and satisfaction. Note that the skills categories are those used by the Bureau of Labor Statistics. “Basic” means something more like “fundamental”, and includes active learning, science and spoken communication. “Technical” means equipment maintenance, operation monitoring, and repairing, as well as programming and technology design. Why aren’t STEM skills used in the most desirable jobs? Like many others, we’ve promoted the idea of learning STEM skills. Is that the wrong advice? This analysis made us less confident, but the advice is still probably valid for a couple of reasons. First, our analysis isn’t very robust, so we wouldn’t draw strong conclusions from it. We discuss these weaknesses in the technical report. Second, there’s a difference between the skills that are useful in the most desirable jobs, which is the focus of this analysis, and the skills that are best to learn. A skill like “judgement” could make you highly employable, but be hard to improve, and so offer poor returns per hour spent learning. STEM skills are not what make people the most employable. But, because they’re easier to improve, they may well be among the best skills to learn. In the next section, we explore other evidence that STEM skills are not what most boost employability, supporting the findings of our initial analysis. Then, we consider which skills are best to spend time learning, and make the case for learning STEM anyway. A researcher at Harvard, David Deming, found that many STEM careers, such as engineering, declined as a share of employment from 2000 to 2012, with the important exception of jobs in computing.1 Much of the growth has instead been in finance, health, and education. Deming also found that wages for jobs that require mathematical skills but not social skills grew under 10% (in real terms), whereas those high in social skills grew almost 30%. Employers were broadly satisfied with the IT, technical and numeracy skills of school / college leavers. They were relatively less satisfied with their problem solving, self-management, analysis, communication and business awareness. What’s going on? We tend to imagine that in the age of automation, you will need to have a technical skill-set to keep up. But actually, the skills that become most valuable are those that are hardest to automate. And those are people skills, not technical skills. Two leading researchers in automation, Frey and Osborne (2013), think that what’s hardest to automate is creativity and social intelligence. Their analysis found that the jobs with the lowest probability of automation were roles like recreational therapist, psychologist, choreographer, teacher, and human resource manager. Today, we have the computer language R to speed-up statistical analysis and Wolfram Alpha to solve equations, but we’re nowhere near having a machine that can tell a joke. These trends could make STEM skills relatively less valuable on average across the factors in our analysis: income, breadth, satisfaction, and risk of automation. You can read more theories about why social skills will become more valuable as more of the economy is automated in David Deming’s full paper. Economic projections point to a need for approximately 1 million more STEM professionals than the U.S. will produce at the current rate over the next decade if the country is to retain its historical preeminence in science and technology. In the UK only 3.5% of science PhDs end up in permanent academic positions. The US Bureau of Labor Statistics reports: “In 2014, the U.S. Census Bureau reported that 74 percent of those who have a bachelor’s degree in a STEM major are not employed in STEM occupations”. In the academic job market, there is no noticeable shortage in any discipline. In fact, there are signs of an oversupply of Ph.D.’s vying for tenure-track faculty positions in many disciplines (e.g., biomedical sciences, physical sciences). In the government…sector, certain STEM disciplines have a shortage of positions at the Ph.D. level (e.g., materials science engineering, nuclear engineering) and in general (e.g., systems engineers, cybersecurity, and intelligence professionals) due to the U.S. citizenship requirement. In contrast, an oversupply of biomedical engineers is seen at the Ph.D. level, and there are transient shortages of electrical engineers and mechanical engineers at advanced-degree levels. In the private sector, software developers, petroleum engineers, data scientists, and those in skilled trades are in high demand; there is an abundant supply of biomedical, chemistry, and physics Ph.D.’s; and transient shortages and surpluses of electrical engineers occur from time to time. This could mean that while STEM majors as a whole aren’t especially in demand, certain types of STEM major are – namely those involving software, data and engineering. Besides being common sense, there is also growing evidence that “soft skills” are highly important in employability, perhaps even rivalling intelligence, which is often seen as the key predictor of success in the academic literature. For many dimensions of behavior and for the sense of “importance” adopted in this paper, noncognitive ability is as important, if not more important, than cognitive ability. What drove the lower scores in our analysis? Let’s now turn back to our analysis, and dig into the scores for programming in particular, to see why it ranked so low down. First, programming scored poorly to moderately across the board – so the low ranking is not the result of a single outlier score. Computer and information research scientists. From this, one point we can see is that not many jobs require programming skills, and these jobs don’t employ many people, so our “breadth” score is low. On reflection, this is not surprising. Social skills are useful almost everywhere, but technical skills are only used in specialist positions. This is a genuine downside, because if you decide you don’t want to work in this narrow range of roles, then your technical skills will no longer be useful. Second, none of these jobs are that highly paid. 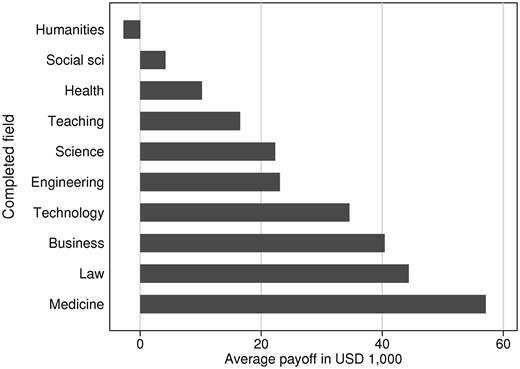 Near the top, the median salary for computer research scientists is $111,000. Most of the jobs are between $40,000 and $80,000. Most very high-earning professions (such as corporate management, finance, sales, medicine or law) don’t require this skill. Moreover, the earnings of these high-earning jobs are probably undercounted in the data we used,6 so the true picture could be even worse for programming. On job satisfaction, statistician and web developer come out around the 30th percentile. The programming jobs don’t include any of the most satisfying jobs, such as many of the careers in healthcare. Frey and Osborne rated statistician and web developer around the 30th percentile for chance of automation. This means they’re better than average, but worse than most healthcare and education jobs, since these require social skills. So, the jobs that require programming skills are just average across the board, and poor on breadth, which drives a below average value score in our analysis. Conversely, it’s not surprising that the most desirable jobs involve “leadership” skills, like problem solving, social skills and management, because these are associated with senior roles. These skills are also very widely applicable. Almost every job requires dealing with people and problem solving; whereas STEM skills are used in a smaller range of positions. As we’ve said, social skills, creativity and problem solving are also the hardest skills to automate, and are relevant in the sectors that are growing fastest (education and health) giving them a good outlook. Might our analysis undervalue STEM skills? One key point to remember is that our analysis is focused on the averages. 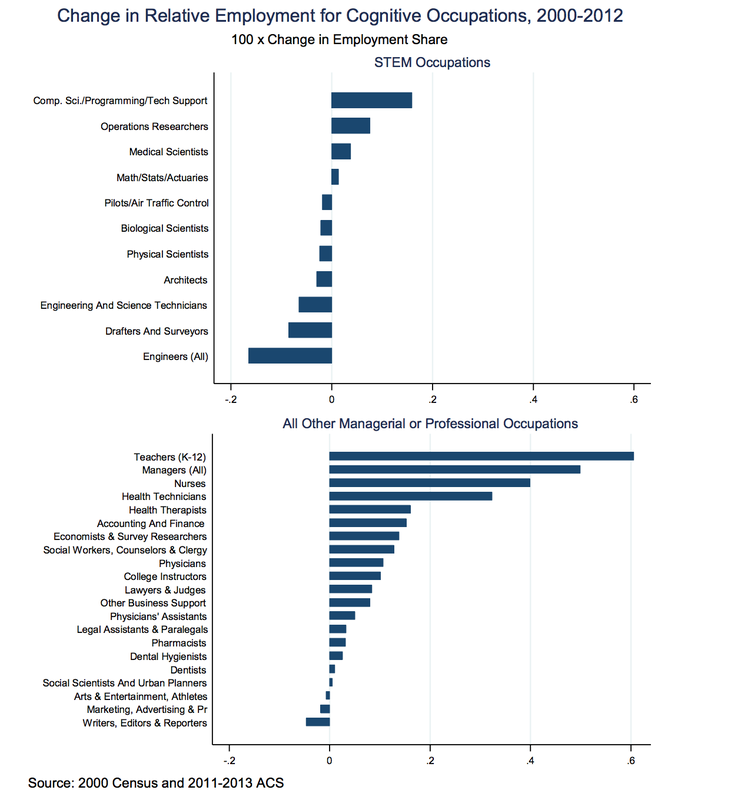 Jobs within computing are growing as a share of jobs, even as other STEM jobs shrink. It might be that many basic technical jobs are being automated, but a minority have growing income. Google engineers seem to be doing pretty well, but they’re roughly in the top 1% by pay among software engineers, so don’t have much impact on our analysis. This matches general trends in income inequality – improving technology empowers the most talented, but, at least in the short-term, reduces income at the median. Certain narrower technical skills might be highly employable (e.g. machine learning) even though “programming” on average isn’t as good. Our analysis only considers growth in the number of jobs, but not changes in the balance of skills used within these jobs. For instance, in finance, many jobs that previously required soft skills and judgment are being replaced by technical jobs. The MIT Technology Review claims that in 2000 Goldman Sachs employed 600 equity traders, whereas now it employs only 2, along with 200 computer engineers. Studying STEM seems like it’s a good way to improve skills like critical thinking and judgment, so it could be useful to study even if you never directly use knowledge of STEM in your job. Knowing about STEM, especially software, also seems to be important general knowledge even if you don’t use it directly. Ultimately, at 80,000 Hours we care about the skills which help people have a greater social impact. Knowledge of STEM is particularly important in innovation, so could be more valuable from that perspective. We’d highlight artificial intelligence and bioengineering as two key areas for social impact. However, we’re also aware that often the most influential, high-impact jobs don’t have STEM skills as a core component. If you want to found a non-profit or a startup, social skills are probably a similar or bigger factor compared with your technical skills. If you want to go into social advocacy, then communication skills are more important. If you simply want to maximise your earnings so you can donate more, then there are still plenty of very high-earning options than don’t require STEM skills, such as law, management, sales, and real estate. Should you learn STEM skills? Perhaps. So does all of this mean that it’s not worth working on your STEM skills? Not necessarily. Explaining why involves looking at some considerations left out of the analysis above. If one skill is much harder to learn than another, it lowers the “return on investment” of time spent learning that skill. We think STEM skills might be faster to improve than “leadership” skills, which means that they are still contenders for the best skills to learn, especially technology. We tried to estimate how difficult the skills are to learn with the “time to learn” score. If a skill is useful in jobs that take a long-time to enter, we rated it as “hard to learn”, and vice versa. We found that many of the most employable skills take the longest to learn, such as judgement, active learning and critical thinking. The STEM skills, however, came out mid-table for “time to learn”. This makes sense. Programming is a concrete body of knowledge that can clearly be improved. If you go to App Academy, you’ll probably be much better at coding than you were before. This means that depending on how you weigh the difficulty of learning each skill, STEM skills could still be among the best to learn. Relatedly, even if you do improve your soft skills, it’s hard to prove to an employer that you possess them. This also reduces the boost you get from learning them. This analysis still shows that STEM skills offer among the highest income boosts, especially technology. However, interestingly, law, medicine and business come out ahead. This analysis was for Norwegian students, but the picture seems similar in the US. Bryan Caplan invested which majors best correlate with income, controlling for SAT scores. The top majors include engineering, economics and mathematics; whereas the humanities rank in the bottom half of majors; while chemistry and biology rank mid-table. So “hard” STEM degrees and technology seem to be among those that most boost employability. These findings might reflect more on the weaknesses of humanities degrees rather than the usefulness of STEM. Our investigation found that the most valuable skills involve analysis, social skills and management. It might be that studying humanities doesn’t do much more to improve these skills than any other major (rather, written communication skills are the key focus). Studying STEM, however, could easily improve your general analysis skills, as well as your technical skills. This analysis by TIME and Payscale found that many technical skills, such as data modeling and search engine marketing, yield among the greatest income boosts in the 2,300 skills they analysed. Their analysis controlled for more factors, so it might be better than ours. They also used a wider range of skills – it could be that the top technical skills are very valuable, whereas most aren’t. However, we’d also want to look at satisfaction and breadth. Anecdotally, we’ve seen lots of examples of people we’ve advised learning programming or data science (especially in bootcamps) then landing jobs that are significantly more satisfying and highly paid than what they had before. This suggests that learning these skills provides a significant boost to at least a fraction of people. Also note that we’re only considering which skills are most useful for people in general. If you’ve already decided on your longer-term career aims, then you might need to learn technical skills. For instance, if you want to work in tech startups, many people say the most useful next step is to learn to program. Moreover, if you have unusually good personal fit with STEM skills, so you could learn them faster than average, then that’s also an important consideration. All told, this analysis has made us less confident that STEM skills are what to focus on after you graduate, but it’s hardly decisive. We think it’s likely that analysis, social and management skills are on average more valuable, but they’re also harder to learn. And it’s unclear how to make that trade-off. Moreover, the case for studying majors like computer science, maths, and engineering still seems strong. What are the most valuable combinations of job skills? This makes sense given the trends in technology we covered earlier. As technology improves, the people who become most needed are those who can both understand quantitative issues, and act as the interface between technology and everyone else. Think startup founder rather than pure engineer. This could also mean that technical skills are useful to learn, so long as they are combined with soft skills. In the future, we’re keen to extend the analysis to consider other combinations of skills. Conclusion: which skills should you learn? Studying STEM at university still seems among the best options for employability, especially computer science, engineering, mathematics and economics (though business and the professional degrees also seem like a contender). We also think computer science, economics and bioengineering are especially useful to know about if you care about social impact. So, these all look like good options if you have good personal fit with the subject. So, in short, our views about what to study haven’t significantly changed. Having said that, while studying, it probably makes sense to do something in your spare time to improve management and social skills, such as running a student society. After you graduate, we’re less sure. One course of action is take any good opportunities you have to improve your leadership skills, then focus on technical skills after that. This is especially true given that the combination of both is what seems most useful. And this is just a generalisation: many people should probably focus mainly on technical skills, and personal fit is a key factor. Within technical skills, the best seem to be those used in the computer industry, such as software engineering, data analysis, digital marketing, and especially artificial intelligence. All told, the common sense advice that “in an age of automation, learn STEM” isn’t obviously true. Soft skills are more likely to be the key to thriving, especially if you combine them with knowledge of software, and overall it’s difficult to work out which skills individuals should focus on. Ultimately, we need more research to move away from cliches, and towards a more nuanced picture of which skills are most valuable. The original paper: D. J. Deming, The Growing Importance of Social Skills in the Labor Market, Harvard University and NBER, August 2016, Archived link, retrieved 13-April-2017. A researcher at Harvard, David Deming, found that many STEM careers, such as engineering declined as a share of employment from 2000 to 2012. This is shown in figure 1 of the paper. He also found that wages for jobs that require mathematical skills but not social skills grew under 10% (real) relative to the others, whereas those high in social skills grew almost 30%. This is shown in figure 5 of the paper. See a popular summary of the paper: The jobs of the future – and two skills you need to get them, reported by the World Economic Forum, Sept 2016, Archived link, retrieved 5 April 2017. This is also where we took the chart in the section on combinations of skills.